The cost of fixing botched work done by illegal gas fitters is costing customers up to £100m a year, according to the Gas Safe Register. It said 250,000 illegal jobs were carried out annually and one in five of those inspected are found to be immediately dangerous. The register replaced the Corgi registration scheme in April 2009. It is urging customers to check that recommended engineers have the right qualifications. Jan Collins from Cheshire tried to save money when she h ired a fitter to install a gas fire in the dining room of her converted barn. He worked for a registered gas engineering company, but he was doing the job for them on the side, more cheaply. However, he was not qualified to put in a liquid petroleum gas (LPG) fire and installed it incorrectly. ''I started getting very bad headaches and very bad nosebleeds and was really quite lethargic," Mrs Collins said. "The chimney sweep was the first to alarm me when he did a test showing that 50% of the carbon monoxide was coming back into the room. A gas inspector confirmed the fire had five major defects, all of which were potentially fatal. Mrs Collins's fitter was eventually prosecuted. It is a legal requirement for gas engineering businesses and individual fitters to be on the register. About 120,000 engineers are on it and a sample of their work is assessed to make sure they are safe. The register also has a record of which appliances each fitter is qualified to work on. ''What we want people to do is take a little bit of care and check they are using a registered person," said Paul Johnstone, chief executive of the Gas Safe Register. "Ask for ID at the door and even before they arrive it is very simple to check they have the right qualifications by going onto our website or phoning us. There are warnings that even registered gas fitters may not always offer the best level of service. Which? says it has been contacted by people who have used gas engineers but who have had continuing problems for years before they have been identified and corrected. ''Being on the Gas Safe register is no guarantee in terms of cost effectiveness, although it may be good in terms of competency," said Matt Bath, a Which? spokesman. "To make sure you are getting the best possible deal and are not locked into an unnecessary contract the best thing to do is to get three good quotes from qualified fitters. "Each quote should show a clear breakdown of what the engineer will deliver as part of the service,'' Mr Bath added. 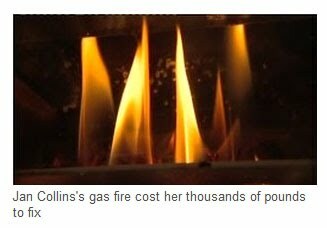 Jan Collins still regrets not making the right checks on the engineer she hired to do her gas work. She wasted thousands of pounds, but could also have lost her life. 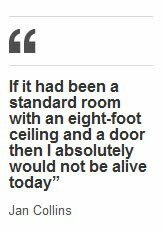 Paul Johnstone of Gas Safe register said that 18 people died last year after gas appliances were installed or repaired badly, adding: "That's 18 deaths too many'. "The cost of fixing botched jobs has also soared," he added. "Customers may spend thousands of fitting appliances and when they've been fitted incorrectly, it costs on average an extra 25% on top of the initial cost to put it right,'' he added.